New Holland Turbo Charger Part WN-SBA135756151 for Skid Steer Loader LS170 LX665. Application / Models: LS170; LX665. Cross Reference Part #: SBA135756151; SBA135756150; SBA135756151T; 135756151; 87771826; 87771827. This item is an OEM aftermarket replacement product. 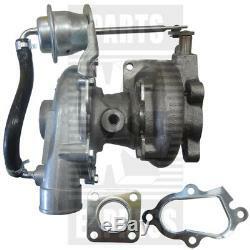 The item "New Holland Turbo Charger Part WN-SBA135756151 for Skid Steer Loader LS170 LX665" is in sale since Thursday, April 5, 2018. This item is in the category "Business & Industrial\Heavy Equipment, Parts & Attachments\Heavy Equipment Parts & Accessories\Farm Implement Parts". The seller is "newhollandrochester" and is located in Leesburg, Indiana.